50% OFF Summer Special (available from now until end of October 2017 on new rentals only). Stay more than 5 days and get the daily rate discounted by 50%. Only $95/day until September 4th (normally $190/day), and $65/day from the 5th of September to October 31st (normally $130/day). This stunning and unusually spacious house is located on the hills surrounding the town of Atenas. It offers the peace and tranquility of a home away from home, as well as a perfect base for touring the beautiful landmarks of Costa Rica. Villa Madrugada is nestled on a large one acre lot surrounded by lush, tropical vegetation and the beautiful, rolling mountains of the Central Valley. 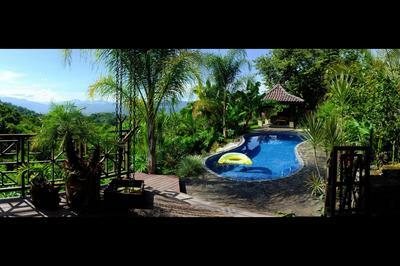 The property has amazing views of the surrounding mountain ranges, creating a tranquil atmosphere for the ultimate in relaxing vacations in Costa Rica! This luxury Pica Flora neighborhood house features many of the wonderful benefits of living in the mountains, including the eternal spring weather and spectacular mountain views dotted with the vibrant colors of Costa Rica’s rainforests. From a spacious deck you can see many fabulous birds including the toucans that visit in the mornings. During the green season, when it generally rains in the afternoons, you can see monkeys, sloths hanging out in the trees in the jungle below and many other types of wildlife too. There is so much here you never know what you may see! Enjoy a peaceful morning in Costa Rica while watching the sunrise over the mountains from the spacious half covered terrace. The spectacular deck offers stunning 180 degree views and is ideal for entertaining guests. The exotic garden is full of bright, vibrant flowers and tropical fruit trees. Enjoy a romantic walk through the garden at dusk while strolling along paved walkways lined with twinkling garden lights. Stretch out tense muscles by swimming a few laps in the open view swimming pool.